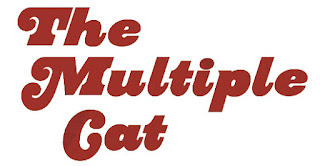 The Multiple Cat, the Quad Cities based indie-rock trio led by singer-songwriter and producer Patrick Stolley – also co-founder and engineer of the popular music site Daytrotter – recently released a new album, Intricate Maps via Catouche Records. Today, we are honored to premiere the video for the tragic yet bouncy new single, “David”. The minimalist, mostly black and white visuals were created last summer by director Atom Burke during his art residency at Residency 108 in Germantown, NY.